It is well known that patients with gastroesophageal reflux disease (GERD) experience GERD-related chest pain, but little is known about the relationship between GERD and coronary artery disease (CAD). We evaluated medical history of GERD in patients with suspected CAD and its association with types of CAD. We enrolled 236 patients who underwent coronary angiography (CAG). We assessed past medical history of each patient, making note of esophageal or stomach diseases such as GERD including reflux esophagitis and non-erosive reflux disease. The patients were divided into the following three subgroups based on the CAG results. Group I, patients with o-CAD (> 50% stenosis with ischemic findings, n = 141); Group II, patients with vasospastic angina (VSA, with positive spasm provocation test without organic coronary stenosis, n = 52); and Group III, patients without organic coronary stenosis or VSA (n = 43). Group I included more men than women (p < 0.001) and the frequencies of smoking, lipid disorders, and diabetes mellitus in this group were higher than those in the other groups (p < 0.01). The frequency of medical history of GERD was significantly higher in Group II (21%) than in Group I (3%) or Group III (7%, p < 0.0001). Logistic regression analysis showed that a medical history of GERD (OR 7.8; p < 0.01) was one of the factors associated with the presence of VSA. 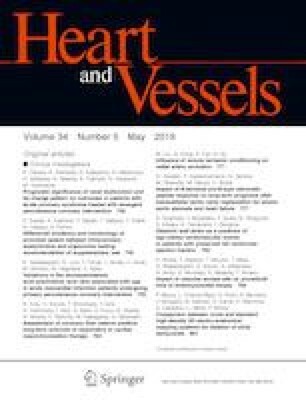 Our findings showed that a medical history of GERD was frequently observed in approximately one-fifth of patients with VSA, indicating that VSA may be present in patients with chest pain and a medical history of GERD. We acknowledge all the staff in the Cardiovascular Ward and Catheterization laboratory room at JR Hiroshima Hospital.